Enter the Cake Contest !!! Generous and wonderful people like you bring a cake to be entered in the exciting cake contest that happens right before the cakewalk. Cakes are judged based on appearance only, so let your imagination go wild! Fabulous ribbon prizes are awarded for the most beautiful, most outrageous, most original, sexiest, goofiest , strangest, most attractive cake etc. 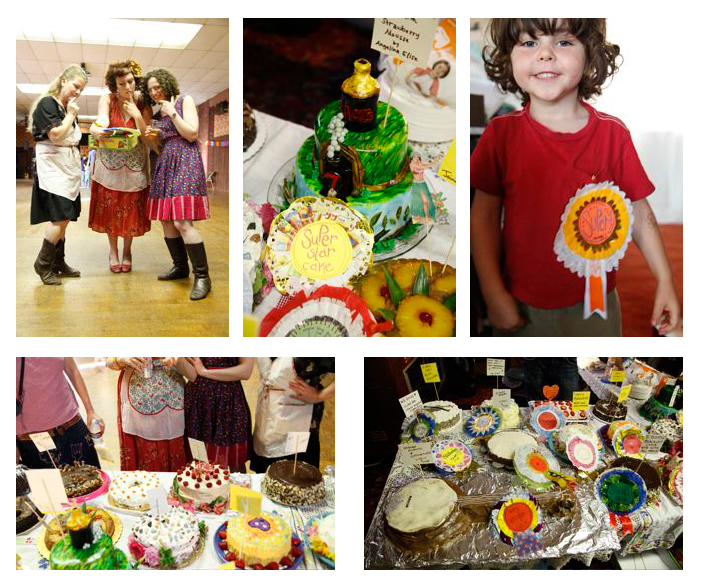 The cakes are then played for by people who are participants in the cakewalk. “What is a cakewalk,” you ask? The easiest way to describe it is it’s like musical chairs but with old time music and dancing and each round there’s a cake as a prize! Wow. Our tradition at the Social is for all cake winners to share all the cakes won at the cake walk at a big yummy cake eating fest as one of the very best parts of the Old Time Social. It probably is EVERYONE’S favorite part of the Social, in fact. There is always plenty of cakes for everyone. The Cakewalk will be on Saturday, May 17th after the family dance at 6:30 and just before the main dance at 8pm-ish! Get your cakes to the Legion Hall no later than 5:30. (227 N. Ave. 55) There will be signs letting you know where to bring the cakes when you arrive. For more info email Katie at katherinecroshier@sbcglobal.net. This entry was posted on Monday, March 31st, 2014 at 6:51 pm. You can follow any responses to this entry through the RSS 2.0 feed. Both comments and pings are currently closed.